Matt Gray, General Manager is standing beside his freshly triple foamed truck and it's smellin' as sweet as it looks! The new features Matt has installed at his newly constructed "Happy Rock Wash" for cars, trucks, semi's, school buses, are sure to entice you to the Grand Opening on Saturday at the north edge of Gladstone. You will find out about all the hottest new items of his beautiful business, plus enjoy free hot dogs, chips, and drink from 11:00 until 3:00. His business which he says has other investors, is designed to please, from the extra cement that goes clear to the entrance road and gives plenty of space for semi's and buses and campers, too, to the extra features of fragrances in the waxes as well as in the "Freshin' Up" Vac that you can use to clean the inside of your vehicle. Allen Miller of M&M Customs in Oquawka, cleverly designed his "Happy Rock Wash" logo. The equipment came from Van Horn, Iowa for two hand bays, and one automatic bay. The automatic bay will measure your vehicle, assess if it is small or as large as a 4 door extended cab pickup, before it will begin the wash you select. The automatic bay is not only unique because it will hold a 4 door extended cab pickup, and allows for up to 7'5" in height, but it has a new TRIPLE FOAM waxing feature that provides a blend of three scented waxes which are applied together in one application round. The manual bay has a 10 foot door and bubble gum flavored wax, and towels and Armor-All are in machines for sale. There is no dryer, but Matt says that it is best to drip dry after a spot free rinse, such as theirs. He also said that a pop and water machine is forth coming as well as the installation of a credit and debit card machine expected within the next week. The facility is very well lighted and will be open 24 hours a day. He will be seeking out service organizations at the school and clubs to incorporate them in using the facility for fundraising events, and to offer them a percentage of the profits. 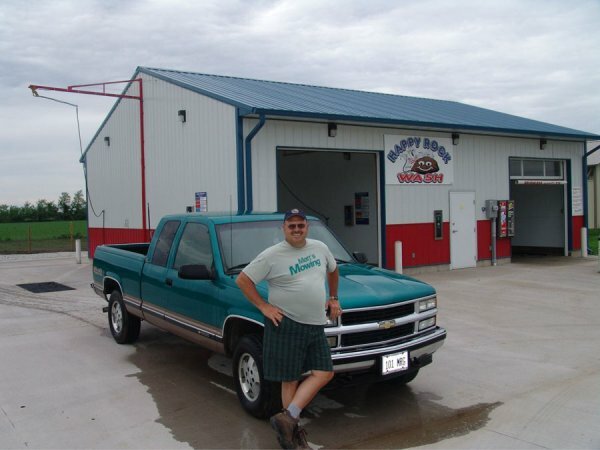 Matt also runs a 33 unit mini storage next to his Happy Rock Wash which is full and he runs a lawn mowing business now in his 23rd year. He presently mows nine cemeteries in the summer out of 17 customers he mows for. Each fall he drives the school bus for West Central on one of the earlier routes beginning at 6:35 am. He is especially happy about the outside bay where he can wash his bus. He is on the Heat football chain gang, runs the clock at the boys and girls basketball games, and as a strong Heat supporter chose the Heat colors at West Central for the colors of his building, red, white, and blue. He invites all to his Grand Opening on Saturday where he will be giving out discount tokens along with food and drink in hopes you will stay in Henderson County and continue to use his facility.